You know, I was going to post a brief entry Saturday morning just to cover Friday evening begore all of the Big Events of the weekend, but I got distracted by things like vacuuming and cleaning the guest bathtub, getting the AirBnB key from unit W201 for Dad and Sherri, and even going to Trader Joe's for fixings for taco salad that we wound up not making until it was just dinner for Shobhit and me on Sunday evening. Suffice it to say, Shobhit and I went out to eat on Friday night, mostly because we had to drive up to Magnuson Park to pick up the numbered bibs for Dad's and my bikes for yesterday's tunnel and viaduct bike ride. The whole thing was, really, Shobhit just wanted to get a Social Review point for Friday. So, even though I pointed out we already had plans to eat out once each day on Saturday and Sunday, he still wanted to find a place to go eat -- he said he'd pay for it. There's actually a café and brewery up there at Magnuson Park, which I'm not sure was there the first and only other time I had ever been to Magnuson Park, in 2006, as part of the first Seattle Parks Tour I did. I totally forgot Magnuson Park is Seattle's second-largest city park, at 350 acres, behind only Discovery Park (534 acres). Shobhit did not have time to accompany me back in 2006 and so this was his first time there ever. It was nighttime and we were only there long enough to pick up the packets and then reject eating at the café, so he really didn't see much of it. We could kind of see a lot of Lake Washington through the dark from the café's front deck steps. Their line was very long, but since their menu is so small and simple, it moved pretty quickly, even though it snaked through about 3/4 of the distance through the small tables in there. They had, I think, pork and beef options for fillings, or just beans, which they assured us were vegetarian -- they don't even carry rice. They do usually carry cactus as one option but they were out. We split to small tacos, one mini burrito and one quesadilla. I liked the quesadilla the best, mostly because it was the only thing with cheese added. The burrito was still pretty good. Still, I'm not sure that, as vegetarians, we found the place to be worth the hoopla. So, whatever; we tried a new place, and now we've been to Tacos Chukís. Gina decided to get out and walk back to the condo with Shobhit, so I could get in the car and guide Beth to our garage, where we had freed up our parking space for them. As for Shobhit's car, we actually parked it in the spot the AirBnB guy only informed me when he gave me the key and fob at 10 a.m. was also available. Shobhit and I still decided it was easier and simpler for Beth still to park in our spot, so we moved our car over there to the garage from the west building entrance -- although, conveniently, the spot was still quite close to the elevator up the east building to our condo. Anyway, Beth parking in our building kept their bikes right by where mine is kept locked to the wall in front of the spot. No biking on Saturday, though -- everyone got settled in, and soon enough the six of us were walking over to the bus stop at 15th & John, to catch a #8. That bus was six minutes late, making it perfect timing, as had the bus been on time we would have just missed it. They had all agreed that this was simpler and easier than driving down there and trying to find a place to park. Come to think of it, the bus stop we got off at was far closer to the staging area than any parking spot we might have found would have been. The event website even noted that nearby parking garages were sold to tunnel and viaduct walkers in advance. God knows how much they jacked up the prices. We were busing down Denny Way, Sherri sitting to my left and behind me, and I mentioned that I didn't think I had ever ridden a city bus with her before. She then told me that as far as she knew, this was the first city bus of any kind she had ever ridden. Whaaaa? So! The brand spanking new State Route 99 Tunnel. The original plan was to be in the tunnel and on the viaduct both Saturday and Sunday -- walking then biking -- but in the end, on Saturday we only did the tunnel walk. The time the six of us had registered for was 2 p.m. Now, I had actually originally registered on my own for 10:30 a.m., with Susan, with whom I had coordinated on Twitter. By January 10, though, she emailed "bailing on you" and told me she was going to opt out: "Too much walking for me. I'm old." That said, it's also possible she caught wind of my compounded plans and that, after my family declared interest over Christmas and we all had to register for a later time, and she thought it would potentially complicate things to more of a degree than she'd prefer. Maybe. I don't really know. Either way, much as I actually would have liked to walk with her, this did come as somewhat of a relief in the end. I'm not sure I realized how tiring it really would be to try walking the tunnel twice. *The nation's first double-decker highway tunnel. *Apparently the second-widest highway tunnel diameter in the world, at 53 feet. *Its lowest depth is 211 feet below the ground, around First & Virginia; it's lowest elevation (of roughly 150 ft below sea level) is below Madison St. It's only as I wrote this very tidbit here that I realized the distinction between those two things: the depth below ground level at First & Virginia is deeper because the hill is higher at that point. *"Bertha," which was used to drill this entire tunnel, is the world's largest tunnel boring machine. Side note: from opening to opening, the tunnel is technically 1.7 miles; I find it kind of annoying how much reporting rounds that all the way up to "two miles." *As part of replacing the Alaskan Way Viaduct, the SR 99 tunnel also replaces the Battery Street Tunnel, which until now was accessed at the north end of the viaduct to get on or off the viaduct. The plan is to fill it up with concrete from the demolished viaduct. Many city residents would love to see it stay open; it still makes a nice, quick bypass from just north of Denny down to Western Avenue. But, I don't expect those residents will get what they want. 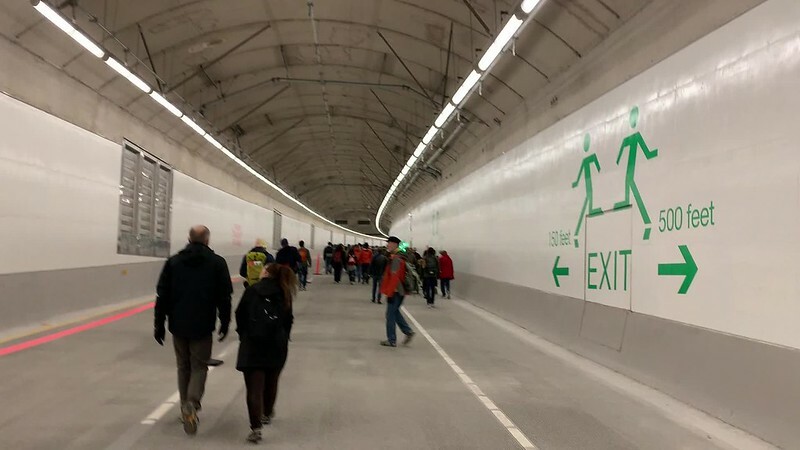 The Department of Transportation says that, like the very reason the viaduct is coming down, this tunnel is seismically vulnerable, and "any new or continued use of the tunnel would require prohibitively expensive renovations." I guess that seems like a pretty legit reason, actually. So anyway, that's all the trivia I have to share about the tunnel the six of us walked through on Saturday. I have to really give Sherri some props now, because to be perfectly honest, Shobhit and I basically expected she would be the one to slow us all down -- and half the time she was pacing up ahead of me! Apparently she's been doing water aerobics twice a week, and is even doing yoga, so she's actually getting some regular exercise. Seriously, I think she was more physically active on Saturday than I've ever seen her in my entire life. She's got some real endurance going on. But! Once we were through the tunnel, she was understandably very, very tired. They had free King County Metro bus shuttles waiting to whisk us all back to the north Portal again, and as it happened, after walking the southbound lanes on the upper deck, the bus drove us northbound via the northbound, lower deck. So really, on Saturday we all walked and drove the tunnel. Okay, a bus driver drove, but you know what I mean. Sherri only had to stop and rest during the initial walk once, that I can recall, and it was pretty close to the south exit when even that happened. When we got off the bus back at the North Portal, though, she was not up for walking the viaduct as initially planned. She decided she would call an Uber, and the rest of us could either go to the viaduct or just bus back home; in the end we collectively decided on the latter. In the meantime, though, there followed a series of odd complications. Sherri did not want to walk the four blocks north to the bus stop on Denny Way, after which we'd still have another five blocks to walk from the bus stop which she was also too tired to do. Dad was trying to insist it would have been way cheaper for her just to catch an Uber on 15th and ride that last bit, especially after the Uber app told her to walk to the southeast corner of John & Dexter for pickup, which was, guess what, all of one block away from Denny Way. And then when an Uber did show up, it was unclear at first whether it was the one for Sherri, who was standing on the corner across the street from us on Dexter, but the car first stopped on our side, and when Gina asked if he was picking up Sherri, he said no, it was another name. Sherri came walking over though and showed him his own photo on her app, and he let her get in. Two details that became clearer once we all got home: even from down there at Dexter and John, Sherri's ride was really cheap -- less than $4 for a mile and a half ride! This was because she had signed up for an "Uber pool," expecting to share the ride with another person -- who was the name the driver had initially said. She never showed up, actually, so even though she was paying for an Uber Pool, she still got the ride for herself. In any case, it was nowhere near the waste of money dad was initially convinced it was, and I suspect Sherri felt pretty vindicated. As for the rest of us, there was a brief moment when Shobhit and I considered breaking off briefly to go over to the viaduct to meet up with Danielle and Gail, who had taken Light Rail up from Angle Lake in an attempt to join us for our 2 p.m. walk. We were in line to enter the tunnel when Danielle was only just reaching Stadium Station on the train, though, and she still had to get in line for one of the shuttles to the North Portal. I don't think even Danielle realized then how long it would take for them to catch up with us via that shuttle, when she texted me, "Wait for us," and I knew my entire group would not particularly be into waiting around for them to show up, not knowing how long it would take. Gina turned and said, "I'm not getting out of line!" To be perfectly fair, she may very well have been being at least half-facetious, but it gave me a convenient out, even though it was a bit unfair of me to throw Gina under the bus: I texted Danielle, Gina says she's not getting out of line. Danielle just wrote back, Ok, see ya later. I'm actually glad I didn't try to pull everyone out of that line, because that exchange was at 2:01 and it was 2:39 before Danielle even got on one of those shuttles! We'd have been waiting nearly an hour. I think Gina got confused as to the difference between Danielle (who I had actually texted that) and Gail (Danielle's mom), because Gina interjected into a Facebook comment thread between Gail and me to say, for the record, I didn't say I wouldn't get out of line to meet you! -- actually, she did; although I probably still should not have told Danielle that -- and Gail didn't even know what the hell she was talking about. Anyway, it was nearly 4:00 when we were all on Dexter figuring out what Sherri was going to do with her Uber, and I finally just called Danielle instead of texting her, to see if she was still on the viaduct and maybe Shobhit and I could go meet up with them. And, they were indeed on the viaduct -- but! They were already at the south end of the pedestrian access to the viaduct, right where they would be getting off down the Seneca Street ramp, from which they would be just continuing south to go back home. Shobhit and I were back at the other end, and we finally realized it would take too long to ask them to wait down there for us, and much further than we really wanted to walk just to get a quick look-see of the viaduct I'd be riding on Sunday anyway. Actually, I just realized this does mean Shobhit never did get on the viaduct at all. Neither he nor Sherri did, because they did not do the Sunday bike ride. Shobhit really didn't care, though; he never gets sentimental about these things. 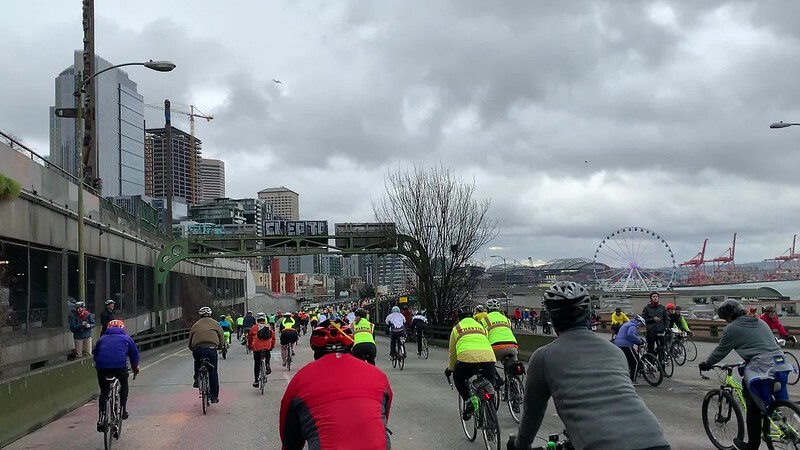 And when it came to the other four of us, none of us really lamented the decision not to walk the viaduct on Saturday since we'd all be riding it on Sunday anyway. So, once Sherri was in her Uber car, the rest of us walked the block back to Denny Way, where we had great bus timing yet again -- another bus delay meant the #8 was all of two blocks away once we got to that stop. And the icing on the cake was that, since we skipped the viaduct walk, the transfers Dad had taken on the way down even though we all assumed they'd be expired by the time we were headed back, were actually barely still valid -- so nobody had to pay for their bus ride back up the hill. Speaking of cake, Bakery Nouveau is located just one block from that bus stop at 15th and John on Capitol Hill, and we went in there to get a cake for both Beth's birthday (I asked her: she's 54), and Gina and Beth's anniversary (3rd). So we stopped in there after getting off the bus, and at their request purchased a German Chocolate cake. The anniversary that they share with Beth's birthday was technically yesterday and not Saturday, but they still accepted Shobhit's offer to get a cake for them (spurred, actually, by Sherri asking a few days ago in a Facebook comment thread whether there would be cake), and at first they declined the offer because they were going to a Super Bowl party they knew there would be cake at. But then we all agreed just getting some cake on Saturday would work too. It was not much later at all when we went out to dinner -- we went to The Pho' on Broadway; Gina and Beth really wanted to get pho', and although the other stuff on their menu isn't particularly special, they have great pho'. It's the place Ivan always likes to go to whenever he and I go out for pho'. I took Shobhit's car and drove Sherri there, parking in the garage below QFC where you can get an hour free parking. It can take so long to get anywhere in Seattle by car, that between that and walking out of the garage and across the street, Sherri and I were seated probably no longer than five minutes before the other four, who had walked, arrived as well. Dad and Sherri both ordered General Tso's chicken and found it to be bland. The rest of us had pho' though and it was very flavorful, and for me at least, really hit the spot. After that we all went back to our condo and had ourselves some cake. I tried a slice myself but could only get through a third of it before I gave the rest to Shobhit. Everyone else, to a person, was openly impressed with how good this cake apparently was; I just can't do shredded coconut, though. I actually tried this time, and couldn't do it. We all met downstairs at our condo complex yesterday morning at 7:00 to head out for an early breakfast at Glo's -- the early time being quite deliberate, as Shobhit and I have learned from experience that if you get there at 8:00 or later, the wait can already be up to 45 minutes long. You get there by 7:30 or so, though, and you get seated pretty quickly. And since everyone was so tired out by the walking on Saturday, we all got to bed incredibly early anyway -- Gina and Beth turned in before it was even 9:00 on Saturday evening, which was after Dad and Sherri had retired to their AirBnB in the west building; even Shobhit and I wound up in bed before it was even 10:00. So, even though I got up around 5:00 just like I do when I go to work, I still had a solid seven and a half hours of sleep and felt quite well rested. In any case, all of us getting to bed so early Saturday night made that 7 a.m. meetup yesterday morning actually pretty easy. This time, Shobhit drove Sherri there, and Dad, Gina, Beth and I all rode our bikes, deciding we would just continue riding back down to the North Portal of the SR 99 tunnel from there once we finished eating. And indeed, even though there were six of us, we were seated immediately. There actually wasn't even that long a wait by the time we were done this time, but that may have been at least partly because it was so cold yesterday morning -- 40°, but according to one site Dad looked up, "feels like 34°." I'm not sure everyone was quite as impressed with Glo's as Shobhit and I kind of wanted them to be -- it's the kind of old-style café that's very much their style -- but they did seem to like the food. They perhaps did not find it to be the best value: Dad was genuinely shocked to learn that the total bill for all six of us was roughly $104, and that did not include the slightly more than $20 "auto gratuity" for parties of five or more. Their several different eggs benedicts dishes are what Shobhit and I go there for, and they are each pretty expensive; including tip, for just Shobhit and me, I paid $42. And all we had was our benedict dishes; we didn't even have any kind of drink to go with them. We feel they're worth it, though. 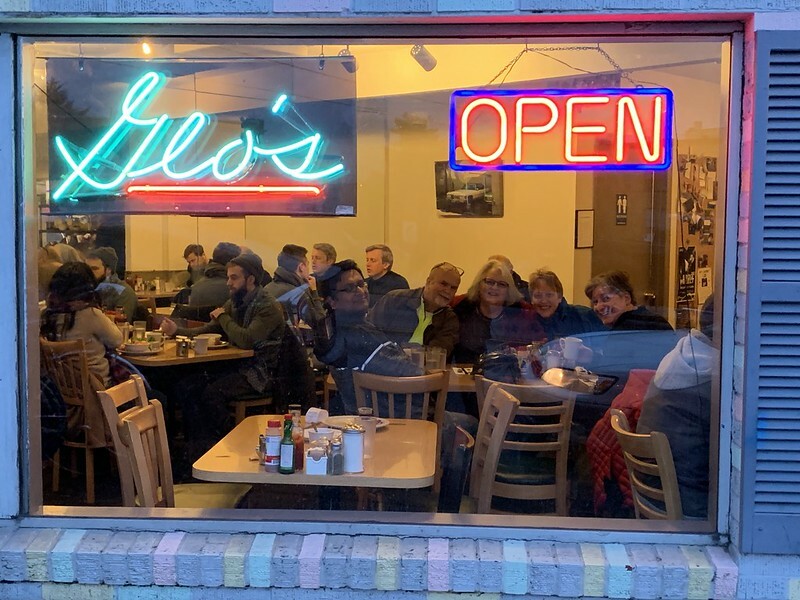 It was also worth going to just to get that spectacular photo I got of everyone else through the window from outside on the sidewalk. The ride was a bit longer than expected, considering the tunnel itself is all of 1.7 miles in length: 12.5 miles, which normally would have been okay for me, except this long ride was literally my first time riding my bike since putting it away for the winter last October. We started at the North Portal of the tunnel, and it was almost shockingly quick by the time we reached the south entrance, given the hour or so it took us to walk the tunnel on Saturday. But, then there was a further two miles (plus) south from the tunnel before we could turn around, at S. Idaho Street. There were several fairly long hills, 4-6% grade, between both the tunnel and some bridge sections of Highway 99 south of the tunnel, which we had to go over both down to S. Idaho St and back. This time, Gina held us back a little bit, being the least experienced cyclist of all of us, and most of the time Beth stuck with her, of course. Still, there were periods where there was only a couple of us together: for me at least, there were moments when I was riding with only Dad; moments when Dad had ridden ahead because he didn't want to lose momentum up hills and so I was just with Beth and Gina; and there was one stretch where I was only with Beth, as somehow Gina had managed to get ahead. Eventually, as we reached the north end of the tunnel going back -- the ride was both southbound and northbound through the tunnel -- I was just with Dad, and after exiting the tunnel, we waited a while for Beth and Gina to catch up. The thing is, last I had seen them, they were ahead of us, so I thought they still were; Dad was pretty sure they were behind us. Now we were unsure, though, and after several minutes, Dad and I decided to keep going on the route over to the Battery Street Tunnel ourselves, thinking maybe they were ahead of us after all. Once we were through the Battery Street Tunnel and onto the Alaskan Way Viaduct, though -- our last time on it ever! -- I went ahead and texted Beth when I stopped for a picture, and finally figured out they were behind us. Actually that exchange happened once Dad and I reached the Seneca Street ramp, and we waited for them there. There were plenty photo opportunities there anyway. Speaking of which, I guess I can take this moment to mention: the 41-shot SR 99 Tunnel Walk photo/video album from Saturday can be viewed on Flickr here; I actually managed to get that entire set captioned before going to bed last night. That album would have had more shots in it, except of course in the end we abandoned the viaduct walk. Then, the 84-shot SR 99 Tunnel and Viaduct Ride photo/video album from yesterday can be viewed on Flickr here; that one is about a quarter of them captioned at present. I hope to get the rest of it captioned by tonight. I already have more photos to upload after this morning because it snowed today. These two albums are also part of a collection I created, for Highway 99 broadly, in which I also included the 2011 "Commemorative Walk" Susan and I did on the south end of the viaduct seven and a half years ago, back when we thought all this stuff would be done two years earlier than this. ("Bertha" had technical problems and delayed excavation for a couple of years.) That one had 37 shots in it. I also have one more set in there, collecting viaduct closure-related photos outside of this past weekend's events. It currently has only nine shots in it but I expect to add more over the next six months (to my surprise, that's all the time they expect it to take) as the viaduct is systematically and carefully demolished -- pretty easily done, I expect, since the viaduct is along my walk to work. Anyway! Back to the weather. I don't want to forget about that -- all things considered, and in spite of it being quite cold, the weather worked out for us very well, on both days! The forecasts for both Saturday and Sunday seemed to change daily as the past week went along, and in the end the forecast for Saturday very much improved, and for Sunday it worsened. Once Saturday got here, the forecast was dry, even though I heard it raining outside when I woke up that morning -- by the time everyone was in town and we were actually at the tunnel, it was merely cloudy and that was it. And, even though rain was in the forecast on Sunday, even by 10 a.m. it was dry that day too, albeit quite cold. But, given how cold it was, I was so glad it didn't rain -- rain at 40°, and riding a bike through it, would have been legitimately miserable. And, there had been media coverage all week of possible snow by the end of the weekend -- which actually did happen starting last night. Sherri said it was snowing in Olympia even by the time they were about to leave yesterday afternoon. Thankfully, though, there was no precipitation whatsoever when we were all outside on either Saturday or Sunday. The weather was great for us especially when we were out on the viaduct, when it otherwise could have been the worst. Okay, back to the viaduct ride, and Gina and Beth catching up with us. They did, and they got some of their own pictures. Then we rode down the Seneca St ramp, turned right on First Avenue, rode about three blocks south and then turned to get on an on-ramp to ride back north on the lower deck of the viaduct, where I got plenty more photos and videos, both riding and stopping a few times. It's unsurprising the Sunday photo set is nearly twice the size of Saturday's, because that day included shots of both the tunnel and the viaduct -- and, as you can imagine, the views from the viaduct are far more photogenic, whether it's of the city or of the Puget Sound. In fact, had yesterday not included the viaduct and was just another ride through the tunnel, that photo album would only have included about 45 shots. The viaduct stretch alone added about 39 pictures. Which, of course, again, you can hop on over to Flickr to view. Getting back home after the ride yesterday was a far greater challenge. Had this happened in, say, spring or summer, when I was already used to commuting on my bike every day, I probably could have made it back up the hill on my bike. But, this being my first ride since October, once we rode up 7th Avenue back to Pine, I walked my bike most of the rest of the way. So did both Dad and Gina. Beth, who bike-commutes in Olympia even in crap weather, rode alongside us slowly on the street, both because she could, and because she had bike cleats on that would have been difficult to walk on. We still got back about an hour earlier than expected, because our plan had been to ride at 10:00 a.m., but we got there closer to 9:00 and got ride into the tunnel on our bikes. So, when we returned to my parking garage and they were strapping their bikes back onto the back of Gina and Beth's car, it was not yet even 11:30 a.m. So, it was early afternoon when the gang headed out, Gina and Beth headed for still more scheduled activities with a Super Bowl party to attend in Olympia. I then spent virtually the entire rest of the day editing, tagging, and uploading photos from this super-eventful weekend, then writing up the requisite photo digest email which I now send out directly from gmail -- so I no longer wait until the next weekday morning to send those out once I'm at work. That email included 19 photos, 17 of them specifically from Saturday or Sunday; it included a ton of hyperlinks to other photos and nearly all my short video clips, though, as well as to several news sites about the tunnel opening and the impending demolition of the viaduct. Shobhit agreed to help out with a new tagging system today where he works, which meant he started super early, at 3 a.m. So, he went to bed quite early last night, maybe sometime between 8 and 9, and he must have gotten up around 2 a.m. I might have spent more time watching TV with him otherwise, but this gave me time to do the aforementioned captioning I finished for the Saturday photo/video album. I did take a break to have some peanut butter ice cream and watch an episode of Crashing on HBO Go, which Shobhit wouldn't have wanted to watch anyway. Then I came back and finished that album's captioning, getting to bed myself sometime around 10:30. So there you have it. We all said hello to the new SR 99 tunnel, and we've all said goodbye to the viaduct.